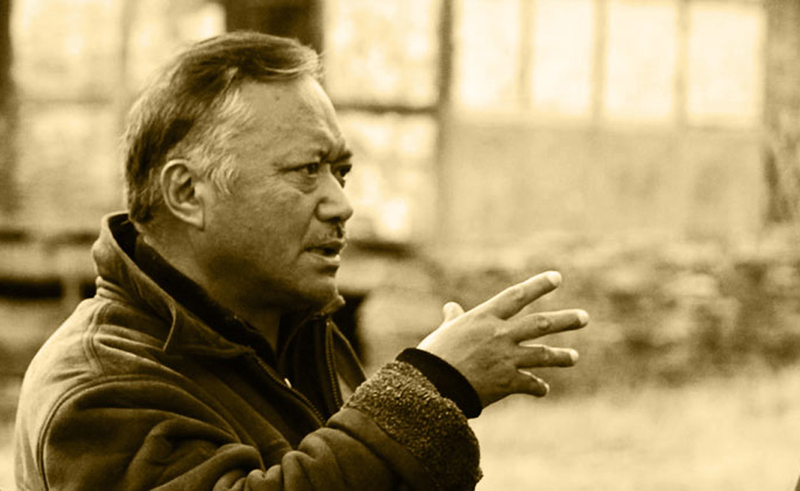 Mr. Jamyang Dorjee, a former Joint Secretary under the Government of Sikkim and who later worked for the Tibetan Government-in-Exile before taking voluntary retirement, has taken the Tibetan calligraphic art to its zenith, transforming the simple, straight Buddhist script forms into works of art with figures of the Buddha and other Buddhist deities as their core. He holds the World record for creating the longest calligraphy scroll, using handmade Tibetan lokta paper measuring 163 metres long, with 65,000 Tibetan characters, made of long-life prayers for His Holiness the XIV Dalai Lama composed by 33 great masters of Tibet. Mr Jamyang Dorjee shared his thoughts on calligraphic art in an exclusive interview with Gelek Namgyal of Tibetan Review on Aug 27, 2014. After taking voluntary retirement, what inspired you to take up Tibetan calligraphic art? Answer: Thank you Gelek la for giving me an opportunity to share some of my thoughts on Tibetan calligraphy. After taking voluntary retirement, I joined an NGO called Trans Himalayan Arts and culture based in Washington DC as a Regional director with our projects in Nepal. With support from my family and the Chairman of the NGO, Kasur Gyari Lodi Gyaltsen, I was able to perfect my Tibetan handwriting and to transform it into art forms. I always wanted to promote calligraphy; seeing that our calligraphy does not find much space in the international arena pained me. And I vowed to take it to the level befitting its beauty. I saw a great untapped wisdom waiting to be revealed. This beautiful holy script was honoured by the emperor of China in 12th century, when Drogon Chogyal Phagpa was invited to his court. I saw an open field, an opportunity, a challenge and commitment to restore a lost pride as a Tibetan in exile. You have taken forward Tibetan calligraphy and transformed it into an art form. What inspired you to do it? Understanding the richness of the Buddha Dharma, the beauty of our own script and so much emphasis on computerisation has prompted me to come out from the tradition and promote this as an art form, while still maintaining the grandeurs of our traditions. Unlike the other calligraphic traditions in the world, where they have histories to look into and get inspired, Tibetan calligraphy art is totally new and frankly speaking I have only my prayers to help me. Where did you learn it and how long did it take to master this calligraphic art? I had a solid foundation, initially for four years in CST Shimla in the 1960s, when we had some of the best teachers of our time, Kyabji Samdhong Rinpoche and Geshe Lharam Lobsang Tharchin la. Throughout my career, I kept in touch but seriously did not find time to practice it. It was only taking voluntary retirement that I started practicing; writing 163 meters for 6 months was a good practice. Thereafter, the creative art door opened for me and I kept on writing different images and designs as and when they came to my mind. How do you choose the subject of your art? My basic parameter is that what I have embarked on is not just a creative visual art but it also conveys a message of peace, compassion and non-violence. If I am able to bring smiles on the face of the audience, a sense of pride on the face of those to whom this scriptural heritage belong, and creates a positive energy in the place where it is displayed, I feel happy. We Buddhists normally read or recite prayers in the morning. I write the prayers and an art is created. It takes a lot of time to plan a design, ensuring that it meets all the qualities of a good calligraphy. When it comes to actual implementation, not much time is taken for writing a normal calligraphy. But for writing deities with miniature writings, it does take many days. I think the requirements are unconditional devotion to the deities, calm mind, enough time, peaceful surrounding, and a supporting family and friends. In an interview you have said that it might take some time for people to understand this art form, why? Tibet before 1959 always concentrated on the development of inner science and all other forms of visual art, including the performing arts, were secondary. The Tibetan attitude towards the appreciation of art, be it thangka painting or contemporary art, will take some time to change. Breaking from handwriting with a pen to calligraphic writing with a brush, is, I think, a historic transformation in our culture. But how many people understand that? While calligraphy is considered the highest form of visual art in China, some in our generation have started contending that learning the U–med form of Tibetan writing is useless. You said in The Hindu newspaper that the entire focus of the Buddhist calligraphy was on the signs and teachings of Buddhism, not on art. How were you able to transform it into art form? 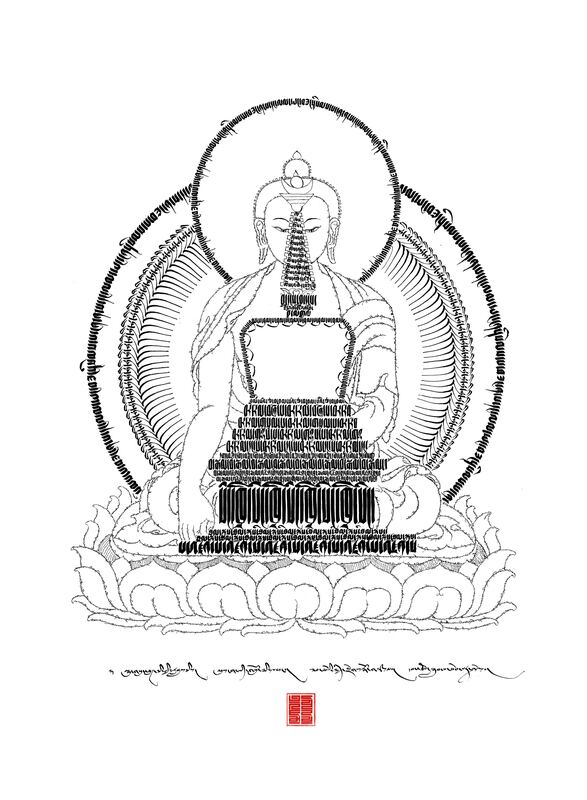 I said that the very purpose of composing the Tibetan script in the 7th century was to translate the Buddha Dharma into the local Tibetan language and hence we consider this as sacred script. This script went through so many transformations; but all throughout, it remained just a handwriting – good, bad, or ugly handwriting. Looking at the Chinese, Japanese and Persian arts of calligraphy, the question logically arises: where are we in this field of art? 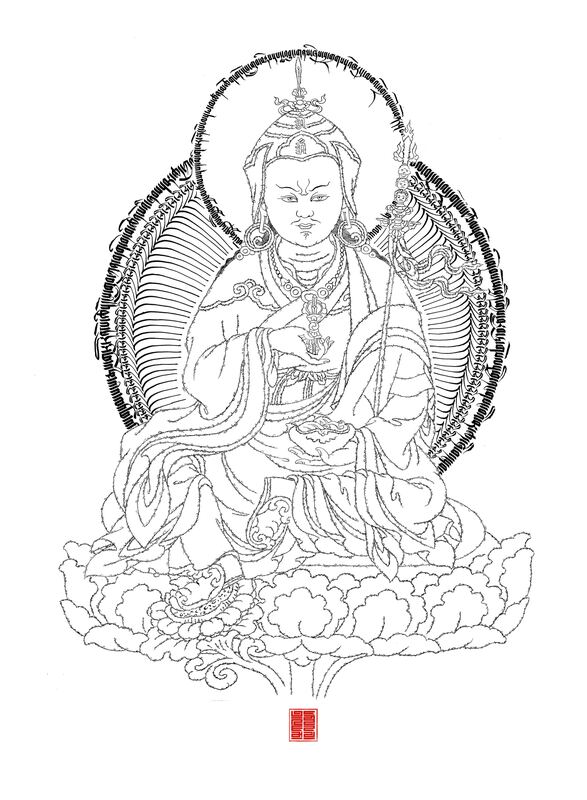 The Tibetan script has all the qualities for being developed into a beautiful art forms with such deep Buddhist wisdom. The very thought of this led me into this art. Aside from creating beautiful art, how will you preserve this art form and pass it to the next generation? I still insist on learning and practicing the handwriting first because one of the basic qualities of a good calligraphy is beautiful handwriting. Recently I got an opportunity to visit the Dalai Lama Institute of Higher studies in Bangalore to speak about this new art form. Also I will visit some of the TCV schools since they have invited me. I try to inspire the younger generation to see this important art for a creative, profitable career. You have recently exhibited your art with Anis Siddiqui, an Urdu calligraphic artist, at the India International Centre, New Delhi. What are you planning next? Yes, it was a proud moment for a Tibetan calligraphy artist to be able to exhibit with Janab Siddique, who is the father of Islamic calligraphy in India. This exhibition, organised by the International Buddhist Confederation, put us at a different level and I am extremely grateful to them. I would like to spend more time in creating more beautiful arts and have some exhibitions both in India and outside planned for the next year.